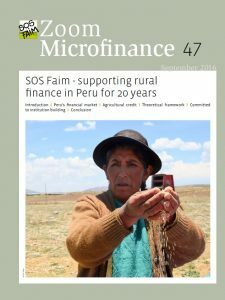 Peru is one of the countries in which microfinance has made the most inroads. For over two decades, SOS Faim has made a significant contribution to the rural and agricultural finance sector. It has done so, in particular, by focusing on the development of financial tools such as guarantee funds, as well as by promoting the creation of specifically rural financial institutions that share the ethos of the cooperative movement. This work took place in a rather favourable environment, with steady annual economic growth and a liberalized approach to financing that generated strong growth amongst microfinance institutions (MFIs) in the country.